Mallards (Anas platyrhynchos) are waterfowl with massive presence all over the planet. In the Northern Hemisphere, mallards are the most prevalent type of duck. The majority of domestic ducks in existence have ancestral roots with these sizable and sturdy puddle ducks. Male and female mallards generally become physically mature around the same age. Mallards generally grow to body lengths of 15 to 16 inches, with wingspans of around 3 feet. 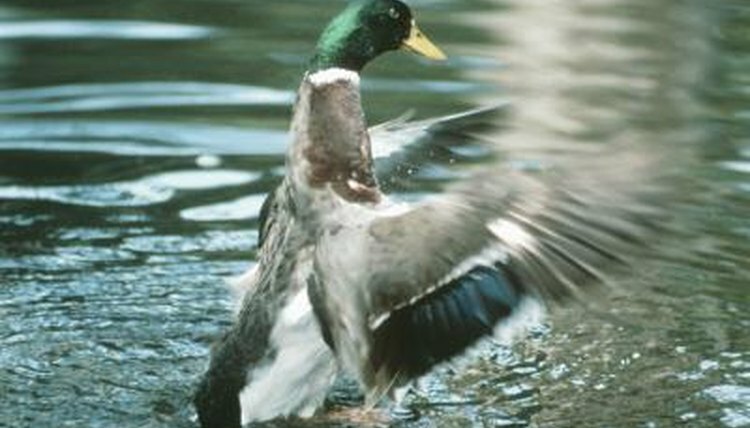 The plumage of male mallards is a combination of green, brown and black. The males' heads are vivid green. The females and youngsters of the species, on the other hand, are a dull brownish color all over their bodies. Females have brownish-orange beaks, while males have yellow beaks. As far as living environments go, mallards are diverse creatures. They frequently inhabit estuaries, ponds, streams, wetlands, rivers and lakes. Mallards are a common sight in parks with lots of humans. Mallards feed on water plants but also readily dine on worms and bugs. They occasionally look to agricultural crops for meals. Mallards reach physical maturity when they're roughly 1 year old. By this time, they are usually capable of reproducing. As youngsters, their development is swift. They usually fledge or take flight by the time they reach 50 days in age. Mallards usually get to their full mature weight between 12 and 14 weeks old. Although the majority of young female mallards begin to breed once they get to a full year in age, it doesn't always have a happy ending. The mortality rate of ducklings of early breeders is much higher than of older females, often due to maternal inexperience. Deaths are also abundant among ducklings of 2 weeks' age or less, often because of predators and climate conditions and other circumstances. The more experience a duckling mother has in caring for her little ones, the higher their odds of making it to adulthood usually are. The reproductive season for the species lasts from March to June each year. Clutches generally consist of five to 14 eggs, which are usually gray, green or yellowish-white in coloring. Mallards, for the most part, have life spans of 5 to 10 years. However, the oldest observed mallard in nature lived to a ripe 26 years.